Pat's Scraps: It's a Boy! For the Die Cuttin' Divas Sketch Challenge, click here. Just had to share another baby card I made for a friend at work. He just became a new Daddy 15 days ago to a new baby boy named Evan. This is the card I made for him. Thanks for visiting! Please come again soon. Very cute, love the color combinations you used. So Sweet! Great paper on this cutie! Hey Pat, it's been a while hasn't it? Hope you had a wonderful holiday season. Love this cutie and that you put his name on it. This is such an adorable card. I really like the mix of papers you used. I always have a hard time coordinating papers like that. OMGoodness, this is just so darn cute!!!! I love it! Thanks fo rthe inspiration. Adorable card!! I love the pretty polka dot paper and the blue and green together looks fantastic! This reminds me of the 3 packs of Peachy Keen stamps I bought before Christmas and I never used. Where the heck did I put those things?! That stamped face looks so cuuute! sooooooooooo cute, of course!! I expect nothing less from someone as wonderful as you! And dust balls are teeny tiny beads with no holes, so they cannot be sewn on, they have to be glued. The even smaller ones are called micro beads! Reaaaalll teeny tiny! 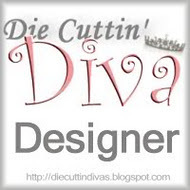 Die Cuttin' Divas Challenge #50-Anything Goes!